Let me start by saying I hated Chloe. Let’s recount our “friendship” with Chloe as seen through Max’s eyes briefly to explain why it’s surprising that in the end, we chose not to let Chloe die. Chloe is killed by Nathan because of a seeming drug deal gone wrong, Max saves her. When her step dad find out someone was just smoking weed, Chloe tries to pass off the still smoking joint on Max, the best friend she just reconnected with after five years. Chloe finds out Max has powers but is incredibly overly skeptical and makes you jump through so many damn hoops to prove that you have them. She first makes you guess what EXACTLY is in her pockets. Then she needs you to tell her exactly what is going to happen next in the diner - she’s not content with 3/4 she needs to know EVERYTHING. Right down to the jukebox fritzing because a cockroach jumped on it. Chloe gets angry at you for taking a call from your suicidal friend over.... leaving the diner 5 minutes earlier? She is really bitchy about it. 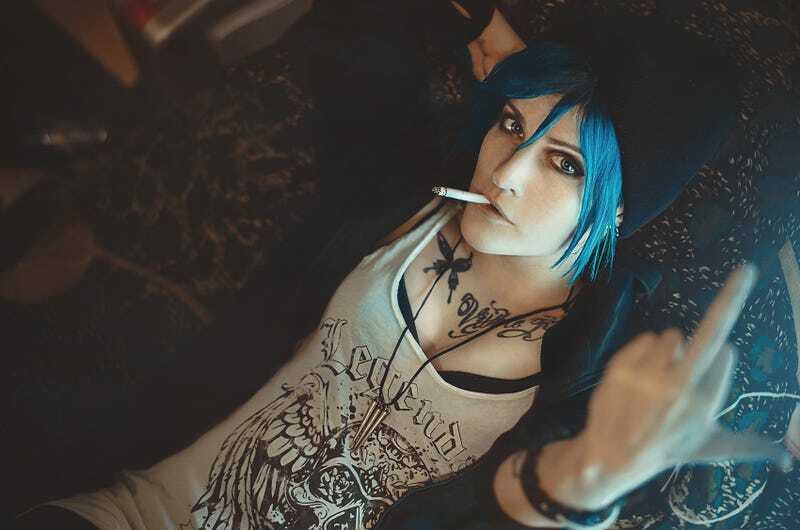 Chloe in an alternate reality timeline, asks Max to kill her by giving her lethal doses of morphine. Who does that? Max, if she doesn’t change the timeline, will definitely be arrested for murder. With no witnesses, and no record from Chloe saying that she asked Max to do it, there’s no evidence to say it was euthanasia. But then Chloe has never been one to think things through. Throughout it all, Chloe has some of the absolutely most cringeworthy dialogue in any game I’ve ever played. Her overuse of certain words and phrases as well as her tendency to talk like someone googled, “How do the hip young kids talk,” and then put those words in her mouth, made sections of the game laughably stupid. Max isn’t entirely blameless here. Her use of her power at first involve going back in time to answer a question right, to prove to someone that she really does know about them (she doesn’t), to unspill soda on a book, and other random meaningless things. The nice thing about Max, and the saving grace of Life is Strange is that her character has a very visible character arc. Her character grows while Chloe’s does not. So why did we (my girlfriend and I) save Chloe then? It goes back to Max. Max starts out as this sort of nebbish “nerd” girl and transitions throughout the game to a pretty solid human being. However throughout it all she uses her time rewind power to learn how to act. It’s her crutch. If something goes wrong, big or small, she is able to just re do it. I tried not to use the time rewind power. My personal philosophy is that we are who we are - the choices we make define the humans that we are. So by being able to change everything whenever she wanted - to me it made Max seem disingenuous and sociopathic. Near the beginning of the game one girl brings up some random trivia about Max and says, “See I know a little about you, what do you even know about me?” To progress the game you’re required to use your rewind power to coerce some self referential information from her and then rewind and parrot it back to her. That made me feel not right. In real life we don’t get do overs. We don’t get second chances. I try to live my life in a way that I make all my decisions as best I can, but most importantly - I forgive myself for the wrong choices I make. Without the opportunity to make the wrong choices, we cannot grow as people, we cannot learn how to deal with failure. Max learns this in a harsh way - towards the end of the game it seems that all the choices she’s rewound come back to haunt her. The antagonists of the game stalk her through nightmarish dreamscapes, while she (I am guessing in a nod to the inanity of it) must collect bottles in order to progress. So that brings us to the choice. Max finally snaps back to present day and is presented with a choice - Go back in time and let Chloe die thereby averting the tornado (somehow), or keep Chloe alive and let the town of Arcadia Bay be ravaged by a tornado. I let Chloe live because in my narrative of the game, Max finally learned the truth - there are no do overs. Even with rewind power, there’s a price to everything and here, now, she finally must live with the consequences of her actions. Chloe is alive, but at the cost of the town being wiped out. It’s a harsh lesson, but life has never been afraid of doling those out. Max will have to live with the fact that her choices led to the town being destroyed and Chloe? Well...I’m convinced she’s beyond help. Hopefully Max ditches her twenty feet down the road.